Defeating your opponents on the move with pinpoint accuracy is why Systema is called the most realistic and effective combat system in the world. In this production, you will discover that the secret of all effective combat lies in natural movements - swift, subtle and effortless. Learn how the skill of true precision is derived from control over your own psyche. Train to merge continuous smooth movement with absolute precision to create the calm and devastating work of the professional master-warrior! Unquestionable MUST HAVE piece of MASTERWORK! Neatly filmed & carefully edited presentation of pure efficiency in a format of live seminar. Over two hours of jaw dropping simplicity delivered by two Systema virtuoso in step by step training progression. Spectrum of the material delivered during this seminar is outstanding from basic mobility through endless applicability wonders to nearly undetectable short work. Somehow between two of them Vladimir & Sergey managed to compress HUGE amount of monumentally amazing material into one seminar with fantastic focus on key details & logical learning sequence. My Systema video library is over a hundred titles but this one is among GET & KEEP items - it is all workable material with years of enjoyable revelations. "It is not what you look at that matters, it is what you see. It is always nice to have a video of a seminar you have attended. It is also rather annoying to see the things you missed while you were there. Vlad's newest DVD: Movement and Precision is now among my favorites of his videos. The first thing I noticed was the superb camera work. The work itself takes place during the May 2009 seminar with Sergey Ozereliev and Vladimir Vasiliev, and what work it is! Take your pick, there is something for everyone in this video: slow work, brutal work, partner work (one against two, two against one, two against two), exercises, and drills. There is also some fun! Seeing Vlad and Sergey doing knife work against one another is worth the price of this video alone. In all that Systema is (brutal yet fun, serious yet enjoyable), this video shows it if you will but see it. In the midst of this video, a medical doctor and student of Systema, gives a great explanation on the difference between thinking, and feeling and the effects of learning. Something a little different in this video is a Camera 2 segment. You see some of the same material except from another angle, from a different camera. This actually provides you with a greater sight picture, if you will. Thankfully, what this video does not have is any fluff. There are no time fillers such as crowd scenes and the like. This video really reminds me of what keeps me in Systema, the sheer fun of brutality. 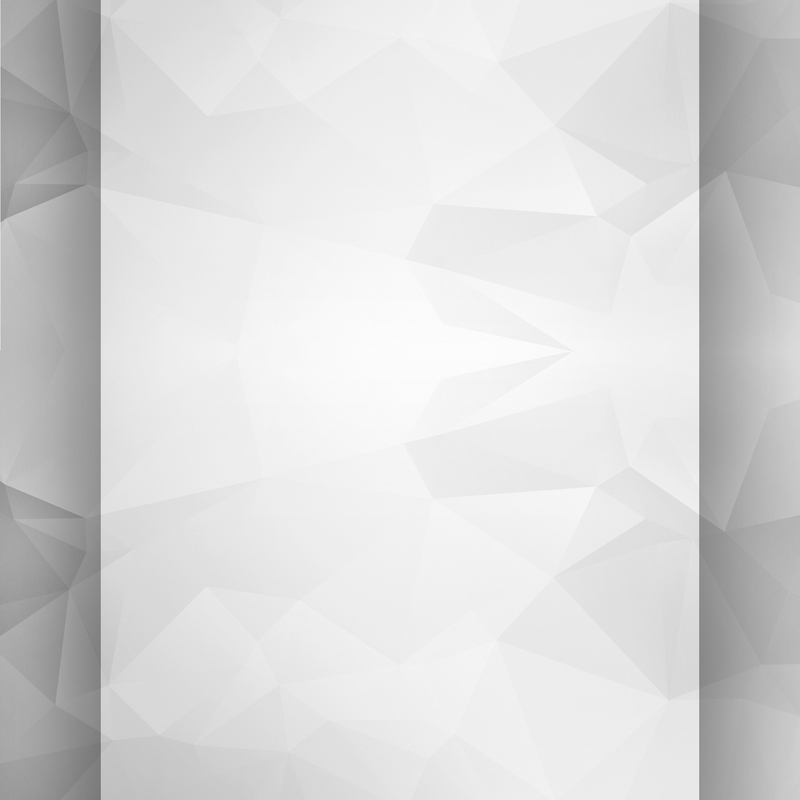 Ok, that did not come out quite right. This is video is one to have. Inspired by Movement INSPIRED BY MOVEMENT - Film reviews "It is not what you look at that matters, it is what you see. 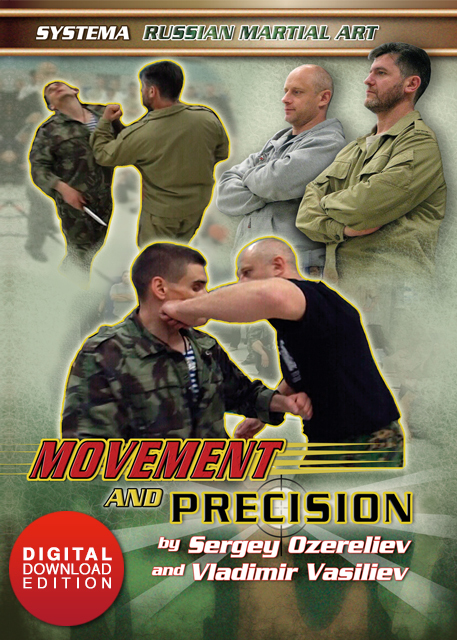 In Movement and Precision, this latest addition to the extensive DVD library library from Vladimir, you will learn to develop precise and effective movement. Clear and relevant demonstrations enhanced by comprehensive narration will give you unparalleled insight into the methods employed by the top masters of this art. Watching Sergey move effortlessly while still keeping "inside" the movement of the attackers will inspire even the most senior students and instructors. You will see how the movement of attackers is picked-up and how he stays with them or "inside their movements". In this way you will see how your own work can be more effective because you are already with the attackers not trying to catch up. The precision develops because you are always in the right place to work. Vladimir keeps impressing in this film. 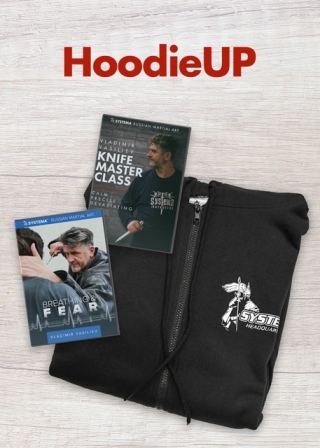 He even allows himself to be attacked with a knife in one scene where you know he could finish off the opponent, but does not, allowing the attacker to come again and again, truly revealing how to stay with the attacker's movements. A wonderful and necessary DVD that will leave you feeling as if you were actually there for every moment of instruction. A must-have of any worthwhile collection.